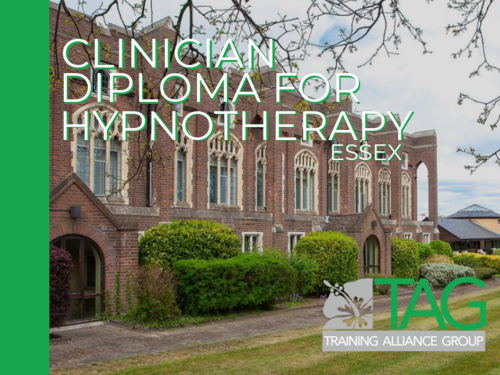 Tag Academy’s Essex hypnotherapy training courses, together with our other venues and our CPD’s, offer accredited educational training designed for student therapists and personal development consultants. While our courses major in hypnosis training, they also provide modules and qualifications in NLP training (Neuro-Linguistic Programming), CBT training through Cognitive Behavioural Psychology, Emotional Freedom Therapy (EFT) and RCP © (Rapid Cognitive Processing – a blending of EMDR, NLP and CBT) − the latter being an excellent intervention for Post Traumatic Stress Disorder, Anxieties and Phobias. Tag Academy provides first class hypnotherapy training in Essex as well as other areas in the South East of the UK including London, Milton Keynes and Brighton. Our highly accredited classroom based courses offer you professional practitioner level training, our diploma gives you a solid base to be a competent therapist. Dates and venue for Essex can be downloaded here. The ten month Essex hypnotherapy training in is for those who are serious about becoming therapists. The training also incorporates diploma modules in NLP training (Neuro-Linguistic Programming), CBT training through Cognitive Behavioural Psychology, RCP (Rapid Cognitive Processing – a blending of EMDR, NLP and CBT) and EFT (Emotional Freedom Therapy), providing you with a variety of therapeutic tools for your practice. secure your place on our essex hypnotherapy training today!